The BSE Sensex closed 176.27 points, or 0.52%, down at 33,891.13, while the Nifty 50 ended 52.45 points, or 0.51%, lower at 10,198.40. Outperforming the benchmark, the BSE MidCap and SmallCap indices rose 0.91% and 0.94%, respectively.Among the sectoral indices IT and teck gained most at over 1%. Capital goods, industrials and realty also rose. On the other hand, energy led losses and fell 2.73%. 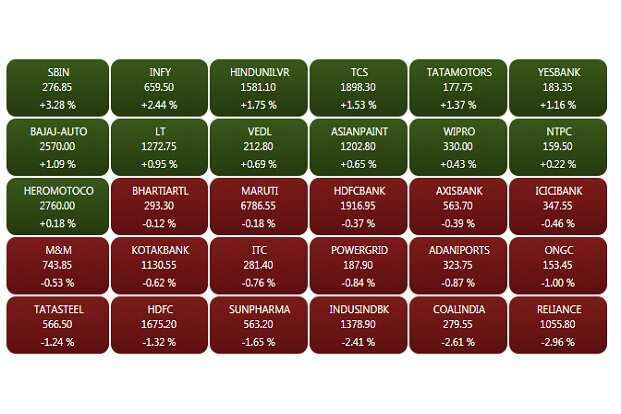 Oil and gas and metal declined 1.70% and 1.21%, respectively.Infosys, Hindustan Unilever, SBI, Tech Mahindra and Dr. Reddy’s Labs were among the major gainers on the key indices, whereas HPCL, IndusInd Bank, BPCL, Reliance and Coal India were among the top losers. Emami Ltd reported consolidated net profit of Rs 82.67 crore in the quarter ended September 30 versus Rs 98.68 crore a year ago. Consolidated revenue from operations stood at Rs 628 crore in the September quarter, unchanged from the same quarter last year. Shares traded 1.28% up at Rs 406 per share, off day’s high of Rs 416 per share. 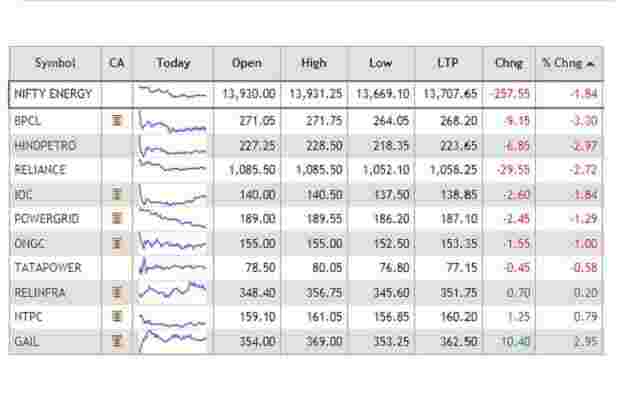 The Nifty Energy Index was down nearly 2% dragged mainly by oil companies BPCL, HPCL and Reliance. BPCL on Monday reported a 47% decline in net profit to Rs 1218.70 crore in September quarter. Revenue was up 1% to Rs 72345.80 crore.Motilal Oswal maintained “buy” rating on BPCL, with TP of Rs 397. “Key risk would be sharing of subsidy burden on LPG/kero and inability to pass on increased cost in auto fuels,” added the brokerage. The BSE Sensex traded 50.72 points, or 0.15%, lower at 34,016.68, while the Nifty 50 was down 14.05 points, or 0.14%, to 10,236.80. The BSE MidCap and SmallCap gained 0.89% and 0.92%, respectively.Among the sectoral indices on BSE, IT, teck and capital goods gained most at over 1%. 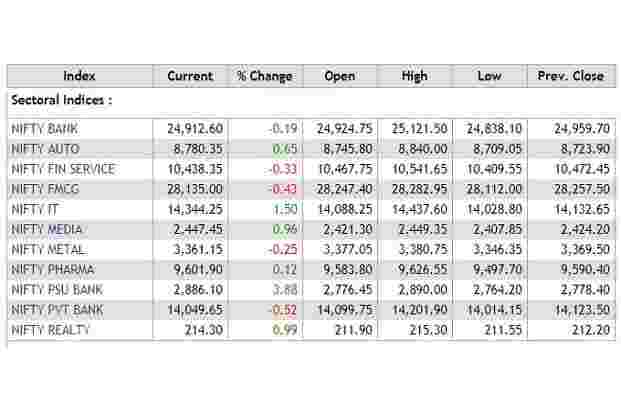 Energy fell 2.15% followed by oil and gas and metal. BPCL shares traded 3.07% lower at Rs 268.45 per share. The company will shut a 120,000 barrels per day crude unit and some secondary units at its Kochi refinery for about three weeks from early December for maintenance, Reuters reported, citing its head of refineries. Shares of Glenmark Pharma traded 0.79% up at Rs 609.60 per share after the company said it has received final approval from the USFDA for Fluocinolone Acetonide topical Oil, a generic version of Derma-Smoothe/FS®1 topical Oil of Hill Dermaceuticals Inc.
Shares of Colgate-Palmolive (India) Ltd rose 1.09% to Rs 1,117.60 per share. The company on Monday reported a 10.58% rise in net profit to Rs 196.37 crore for the quarter ended September 30, compared to Rs 177.57 crore last year.Edelweiss Securities said, “We expect Colgate’s innovation funnel and brand investments to keep flowing which should help arrest its market share loss. However, rising promotional intensity is a monitorable.” The brokerage maintained “Hold”, with a TP of Rs 1,206.Prabhudas Lilladher said, “Colgate is showing early signs of faint revival with lower market share loss in Total and Sensitive. However, sustained market share gains look uncertain as of now. 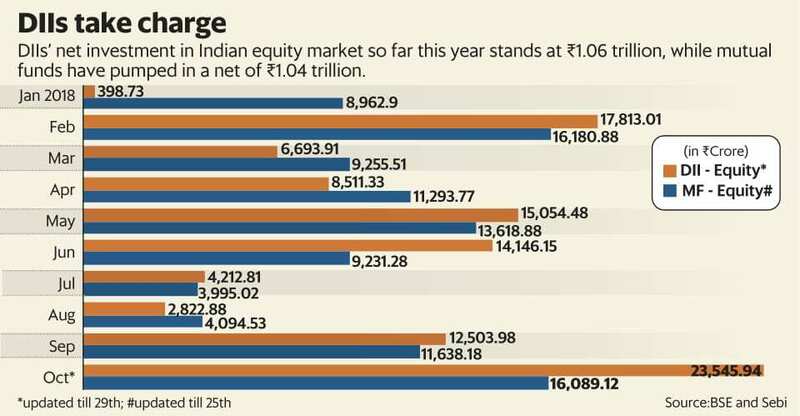 Although Patanjali euphoria has cooled down, competition still remains intense with Dabur’s Red gel, HUVR’s success with “Ayush” and Patanjali’s new variants.” The brokerage upgraded the stock to “Hold”, with the TP of Rs 1,157. The BSE Sensex traded 7.68 points, or 0.02%, lower at 34,059.72, while the Nifty 50 was down 1.90 points, or 0.02%, to 10,248.95. 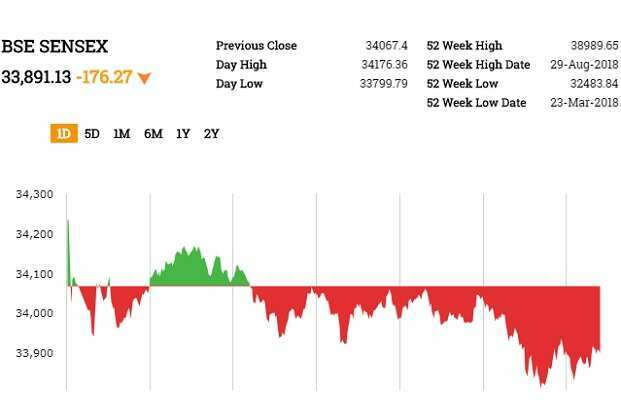 In early trade, the Sensex fell 135 points to 33,931.47, and the Nifty 50 declined 44 points to 10,206.30. Shares of Bharat Petroleum Corp Ltd fell as much as 3.95% to Rs 266 after the company reported a 47% decline in net profit to Rs 1218.70 crore in September quarter. Revenue was up 1% to Rs 72345.80 crore.